I assert that the world would be a better place if each major system of ideology or ideals was open to change. By change, I mean the responsible consideration of relevant issues in the active text and revision accordingly by bodies assigned the authority to propose and make change. The analog in the software world is “change control” and typically a change control system, such as GitHub, is used to manage the issues and their resolutions and the changes themselves relative to the text. Today the major religious texts are closed to change (Bible, Qur’an/Hadiths, Talmud, etc). The Constitution of the U.S. is so difficult to change that it essentially closed. When a system written in another time, place, or condition is applied to the modern world – there are those who are fundamentalist adherents to the original text and there are those who attempt to interpret the intent in the original era and apply it to the modern world. Neither of these is a good approach – they are both signs of a closed system. 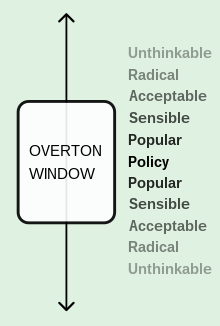 Change to these systems is generally considered unthinkable or radical, i.e., outside the Overton window. (see figure below from wikipedia). If, instead, these systems were open to responsible, well-considered change, then humanity could potentially move past some major problems. Of course, that is a big IF – because it begs the question of the intentions and wisdom of those who manage the change. However, I dare say the risk of changing is much less than the suffering caused by rigid anachronistic systems.